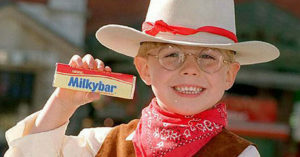 The UK Health Secretary, Jeremy Hunt, is proposing legislation to reduce the escalation of child obesity. Are the measures too little too late? 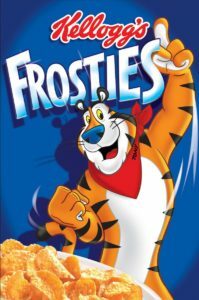 The UK government did bring out its first child obesity strategy in in August 20163 , but, true to form, it became significantly watered down under predictable pressure from industry campaigners. Once again, profits over public health. The fact that the above were booted out in 2016 doesn’t give the greatest hope for them being included in future strategies. What a cynic I am! 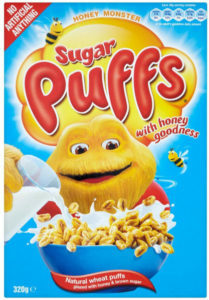 But can you really see Tony Tiger, the Milky Bar Kid and the Honey Monster being banned from promoting sugary snacks? 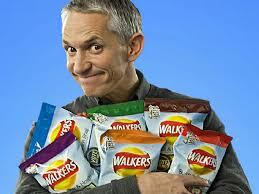 and Gary Lineker barred from advertising Walkers crisps? Figures published earlier this week4 revealed that more than 22,000 children will leave UK primary schools dangerously obese this year. 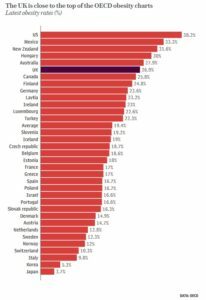 The UK is close to the top of the OECD obesity charts, as can be seen from the following OECD Obesity chart. If you want to avoid obesity, it appears that eating like the Japanese is not a bad idea. 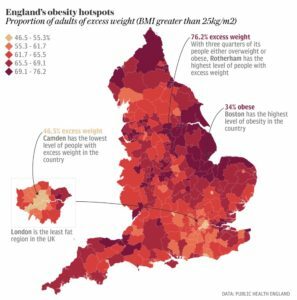 And if you want to see which areas in England have the highest levels of obesity, the following UK government map6 should give you an idea. I am doubtful that anything major will be done to tackle obesity within the forthcoming government strategy paper. It appears to me that the government is ignoring the elephant in the room – the fact that our overall diets are killing us. Tinkering with the edges of the problem at supermarket tills and in TV adverts is, of course, a useful starting point; but I suspect that real change will only come when pressure on the NHS (UK’s National Health Service) is sufficient to justify obese people being banned from operations and treatment unless they lose weight. Once this starts to happen, the increasingly large obese section of our populations will put such pressure on politicians that they will have to introduce draconian legislation which, I hope, will take into account the benefits of WFPB diets and the elimination of processed junk foods once and for all. I live in hope, or should that be – I live in a fool’s paradise?